It is sometimes easy to overlook the importance of the goalkeeper. While midfielders and strikers are the ones who generally get the glory of scoring goals, spare a thought for the men in between the sticks, whose exploits are often pushed, at least partly, into the shade by their outfield peers. And yet so often shot-stoppers have been decisive in determining the fortunes of their side, with the fingertips here or a boot there the difference between success and failure. FIFA has set to recognise this importance at the World Cup by introducing an award for the outstanding goalkeeper of the tournament. This was first brought in for the USA ‘94 competition, under the guise of the Yashin Award, named after the great USSR goalkeeper Lev Yashin, who is often considered one of the best keepers in history. Since then, it has morphed into the Golden Glove Award and stands along with the Golden Ball and Golden Boot as one of the major individual prizes given out at the finals. Only once since it’s inception has it been granted to a player who did not make the final of the tournament – Belgium’s Michel Preud’homme in 1994 – while four of the six previous winners have also gone on to lift the World Cup trophy itself. 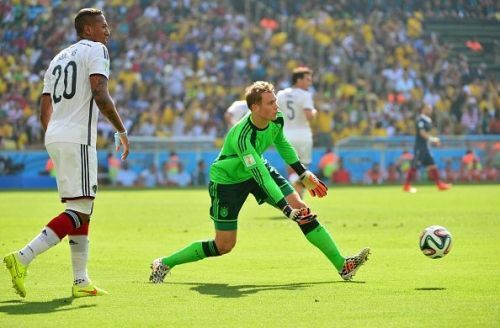 Germany is the only country to boast two Golden Glove winners, with Manuel Neuer claiming the honours at Brazil 2014, which was claimed by his country thanks to a 1-0 win over Argentina in the final. Neuer, meanwhile, was to the fore as he followed in the tradition of fine Bayern Munich goalkeepers such as Sepp Maier and Oliver Khan impressing on the world stage for the national team. Over the course of the tournament, he conceded four goals and kept three cleansheets, which helped cement his place as one of the best keepers in the game. He certainly benefitted from the strength of the defensive line in front of him, although when he was left exposed by the high press that the Germans chose to employ, he inevitably swept behind them in imperious manner. This was best displayed in the last-16 match against Algeria, in which the Germans squeezed through 2-1 against a competitive Algeria side. In the final, his imposing manner was considered to have put off both Gonzalo Higuain and Rodrigo Palacio when they were well placed, with his aura as much as anything else quelling the threat from the Argentines. If he is to repeat those heroics of four years ago, he will have to overcome an injury that kept him out for the vast majority of Bayern’s season.